One portal solution. Endless possibilities. Transform your systems into an integrated portal experience for all of your business customers. Reduce your TCO while providing a better customer experience. Our portal solutions turn fragmented and static data into integrated and interactive experiences. They make it easier for your customers to do business with you – and more efficient for you to do business with your customers. 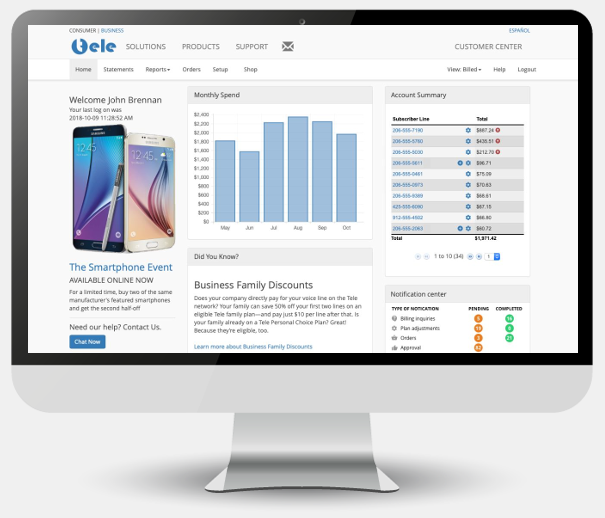 Save time for your business customers by giving them a customizable portal to buy, manage and pay for all products and services. Leverage patented, software solutions designed to deflect inquiries, eliminate paper, resolve disputes, process payments and automate cash application. Increase and accelerate cash flow. Reduce delayed payments by enabling your customers to monitor real-time usage, take immediate action, and quickly validate the resulting monthly invoices. Be part of an innovative team breaking new ground on the digital experience frontier.